Here's how to spot it in the night sky. Leo can be found prowling the Spring night skies. This sky map shows Leo over New York at 11 p.m. EDT on March 22, 2019. For each season of the year, there is a "keynote" star pattern. During the winter, the stand-out constellation is Orion, the Hunter. During the fall, it might be the Great Square of Pegasus; while in the summer, we might consider three bright stars — from three different constellations — that form a bright triangle, known as the Summer Triangle. Or perhaps some would prefer to bestow the keynote title on Scorpius, the Scorpion, although for most who live in northern climes, that celestial arachnid seems to creep along the southern horizon almost like a scorpion might do. There is no question, however, which constellation is associated with spring. 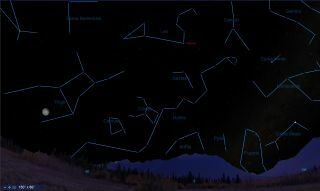 This week, all you need to do is step outside around 9:30 p.m. and look high in the south-southeast sky to catch sight of a stellar Sickle (or backward question mark). It is so clearly marked in the sky that any neophyte astronomer will immediately recognize it, once it's pointed out to him or her. The Sickle marks the head, flowing mane and chest of Leo, the Lion. Six stars form the Sickle. The brightest of these is also one of the 21 brightest stars in the sky: Regulus, located at the end of the handle. It's a blue star and was one of the four "royal stars" of Persia, which were supposed long ago to rule over the four seasonal quarters of the heavens. The other three were Fomalhaut (autumn), Aldebaran (winter) and Antares (summer). Regulus is 79 light-years from us. It's actually not a single star, but rather a quadruple star system: four stars organized into two pairs. The primary component — the one that we can see with our eyes — is approximately 3.5 times more massive than our sun and about 140 times more luminous. In addition, Regulus rotates on its axis exceedingly fast. Our sun takes about four weeks to turn once on its axis, but Regulus spins on its axis faster than the Earth does, taking less than 16 hours. The result of such rapid spinning gives us the impression that Regulus is squashed at the poles and bulges out at its equator. Eastward, to the left from the Sickle, there is a right-triangle configuration of stars that also belongs to Leo. At the eastern point of this triangle, you'll find another bright star, the second brightest next to Regulus, whose name is Denebola, the "tail" of the Lion. There are actually several other stars with "Deneb" as part of their respective monikers, all marking the tail of other imaginary creatures. For example, the star Deneb marks the tail feathers of Cygnus, the Swan. Deneb Algedi marks the tail of Capricornus, the Sea Goat, while Deneb Kaitos is the tail of Cetus, the Whale. The third-brightest star in Leo can be found in the blade of the Sickle and is known as Algieba. Appearing as a single star to the naked eye, it's really a very fine double star, which can be resolved in a moderately large telescope as a pair of stars: one has an orange-yellow color and the other has a greenish tinge. Leo is one of 12 zodiacal constellations that has a reasonable resemblance to the animal it is supposed to represent. To many, it resembles a lion in a reclining position not unlike the Egyptian Sphinx, the lion-shaped monument by the Nile with a human face. Then again, Leo may not have become a lion in the sky because of any visualized comparison to the king of beasts. Rather, the ancient Babylonians and other cultures of Southwest Asia may have associated Leo with the sun, because the summer solstice occurred when the sun was in that part of the sky. Lions were also identified with summer in Egypt. At that time of year, the lions from the outlying deserts came down into the Nile Valley to find relief from the great heat, and lions were thus commonly associated with hot weather. Is there any wonder then, that the pattern of stars that contained the summer solstice was dedicated to a lion? And some believe that the Sphinx was meant to associate Egyptian kings with the power of the celestial lion. In fact, around 5,000 B.C., the position of the solstice very closely aligned with Regulus. And although it is at the bottom of the list of the 21 stars of the first magnitude, because of its dominant position relative to the summer solstice seven millennia ago, it has always been extremely important in astronomy as well as astrology. Regulus means "little king" and, certainly, it rules this part of the sky. In modern times, the sun passes Regulus about Aug. 22 on the way south to its crossing of the equator at the beginning of autumn. Lions are members of the cat family, and it is interesting to note that there are several cat-related animals that populate the region of the sky around Leo. In fact, at one time there was actually a cat prowling the sky to the south of the Lion. Felis, the Cat, was the creation of an 18th-century Frenchman, Joseph-Jérôme le Français de Lalande (1732 to1807). Lalande attributed the placement of a feline in his star atlas to his affinity for cats: "I am very fond of cats," he confessed, adding, "I will let this figure scratch on the chart." Perhaps the placement of a cat was something of a catharsis for Lalande, who was usually a rather serious individual. "The starry sky has worried me quite enough in my life, so that now I can have my joke with it." Although Felis does not exist on star charts today, cat lovers can be consoled by the fact that there are two other members of the cat family that are well situated and close together in the March evening sky: Leo Minor, the Smaller Lion and Lynx, the Lynx. Next week we'll give the dogs that roam our early spring sky equal time.